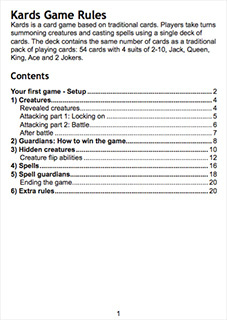 I made a proper table of contents for the rule book as shown in the screenshot. Getting the line of dots also known as tab leaders was more complicated than I would have liked. I also added page numbers. I reread the rules from start to finish and made some small adjustments. A pdf is made and ready to print a draft. What’s next: get the draft rule book printed out and made. Hopefully get someone to try and read though it and see if they understand the game. Also back to play testing the digital version.